Research shows that a single bottle can hold dozens or possibly even thousands of microscopic plastic particles. Twenty-seven different lots of bottled water from 11 different brands purchased in 19 locations across 9 different countries were analyzed for microplastic contamination using a Nile Red stain, which adsorbs to polymeric material and fluoresces under specific wavelengths of incident light. The use of the fluorescent dye allowed for smaller particles to be detected as compared to a similar study of tap water using a Rose Bengal stain, though the analytical methods employed for their enumeration restricted the lower size limit to 6.5 micrometers. 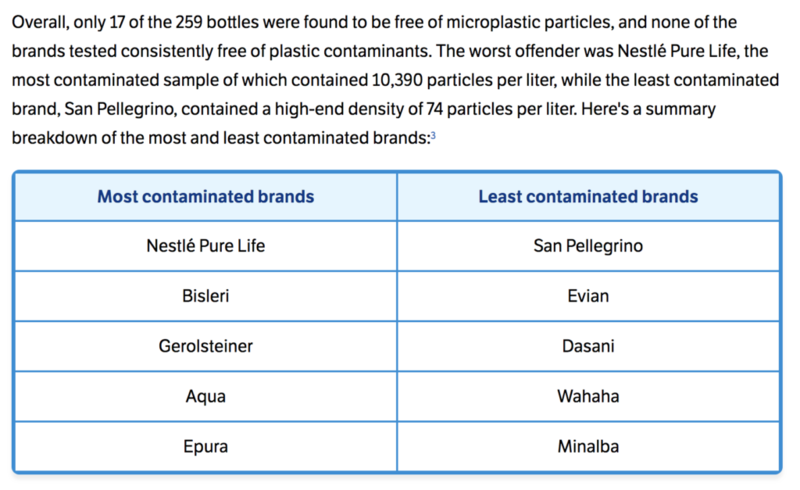 Of the 259 total bottles analyzed, 93% showed signs of microplastics. 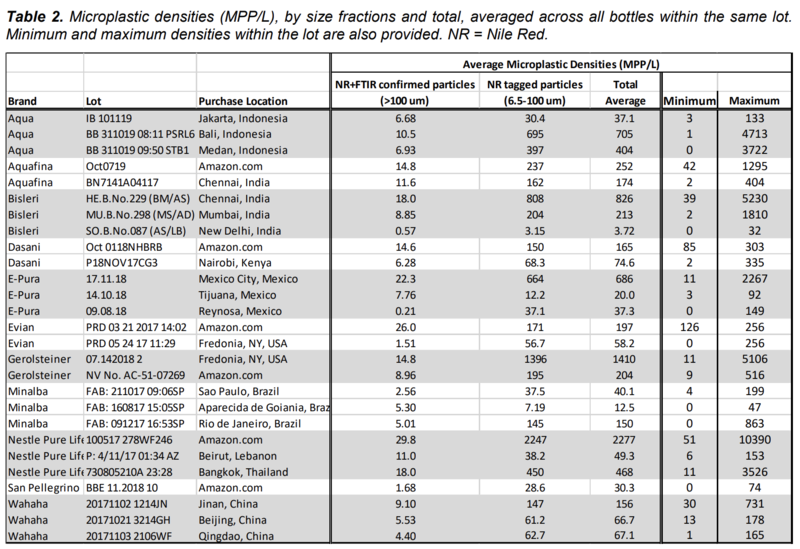 There was significant variation even among bottles of the same brand and lot, which is consistent with environmental sampling and likely resulting from the complexities of microplastic sources, the manufacturing process and particle-fluid dynamics, among others. 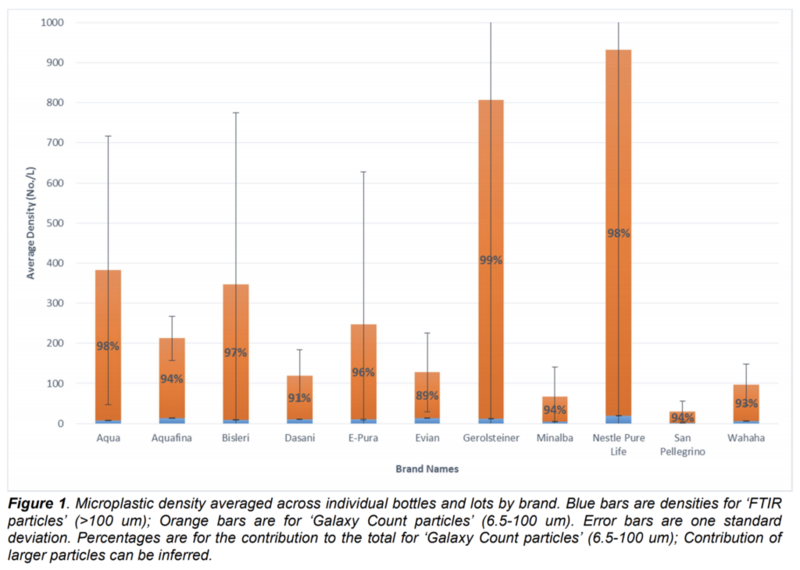 As bottle volume varied across brands, absolute particle counts were divided by bottle volume in order to produce microplastic particle densities that were comparable across all brands, lots and bottles. These densities were reduced by lab blanks in order to account for any possible contamination. Given our use of lab blanks, the inability to photograph the full filter, the lower limit of one pixel being equivalent to 6.5 micrometers, and control runs of the software employed to digitally count particles less than 100 micrometers, the numbers reported here are very conservative and likely undercounting, especially with regard to smaller microplastics (<100 micrometers), which were found to be more prominent (on average 95%) as compared to particles greater than 100 micrometers (on average 5%). Infrared analysis of particles greater than 100 micrometers in size confirmed microplastic identity and found polypropylene to be the most common (54%) polymeric material (at least with regard to these larger microplastics), consistent with a common plastic employed to manufacture bottle caps. Smaller particles (6.5–100 micrometers) could not be analyzed for polymer identification given the analytical limits of the lab. While these smaller particles could not be spectroscopically confirmed as plastic, Nile Red adsorbs to hydrophobic (‘water-fearing’) materials, which are not reasonably expected to be naturally found within bottled water. Our FTIR analysis of larger (>100 um particles) fluorescing particles, all of which were confirmed to be polymeric, provides additional support of the selective binding of NR to microplastic particles within the samples. Even further, Schymanski et al. (2018) did spectroscopically confirm (via Raman) particles within this smaller size range in German bottled water as being polymeric in nature provide additional support for their presence. Given this and following the conclusions of prior studies (e.g., Maes et al. (2017) and Erni-Cassola et al. (2017)) the adsorption of Nile Red alone was used to confer microplastic identity to these smaller particles. As the specific polymer content could not be determined, they could very well show a different compositional pattern as compared to the larger particles analyzed. This could explain the difference in our polymeric compositional analysis relative to a very recent and similar analysis of bottled mineral waters by Schymanski et al. (2018), which found PEST (polyester+polyethylene terephthalate) to be the most common polymeric material, consistent with a common plastic employed to manufacture the bottle itself. Being composed largely, if not entirely, of hydrocarbon chains, the lack of double bonds or other functional groups provides an inherent stability to its molecules, and its synthetic nature means that the vast majority of microorganisms haven’t evolved to utilize plastic as a food source. Thus while plastic will break into smaller and smaller particles via photo-oxidative mechanisms, the fundamental molecular structures of the material change very little throughout that process. Plastics become microplastics become nanoplastics, but they are all plastics, just of increasingly smaller size, allowing them to be more easily ingested and perhaps even cross the gastrointestinal tract to be transported throughout a living organism. Polypropylene was found to be the most common polymeric material (54%) with Nylon being the second most abundant (16%) (Figure 2). Polypropylene is a polymer often used to make plastic bottle caps, along with polyethylene, which corresponded to 10% of the particles analyzed. Interestingly, 4% of retrieved particles were found to have signatures of industrial lubricants coating the polymer. Part of the microplastic contamination is arising from the packaging material &/or the bottling process itself.